On Day One of Synod 2015, conservatives strike first That strike was dealt by Hungarian Cardinal Péter Erdő, the man chosen to guide the synod's work. The progressives like Kasper want to have divorced/remarried people take communion based on the idea of being merciful. The conservatives will almost certainly not allow this to become an accepted MO. Some believe the problem will be solved by the Pope having made annulments cheaper and less complicated, but as I mentioned earlier, most people don't decide not to get annulments because they cost too much or because they are complicated .... many people just don't want to embrace the fiction that their failed marriage was never really a marriage at all. 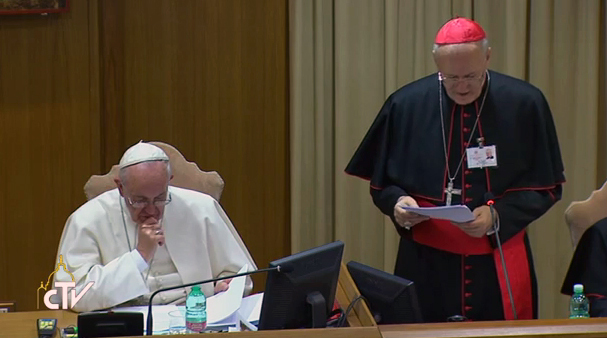 What will not come up at the synod is any re-examination of what Jesus said and meant about divorce. I fear that the synod will end up keeping things as they now are. Yeah, interesting to see the process anyway.